DA Form 5587 or the "Report Of Drydocking, Painting And Condition Of Vessel Bottom" is a Department of the Army-issued form used by and within the United States Military. The form - often incorrectly referred to as the DD form 5587 - was last revised on August 1, 2004. 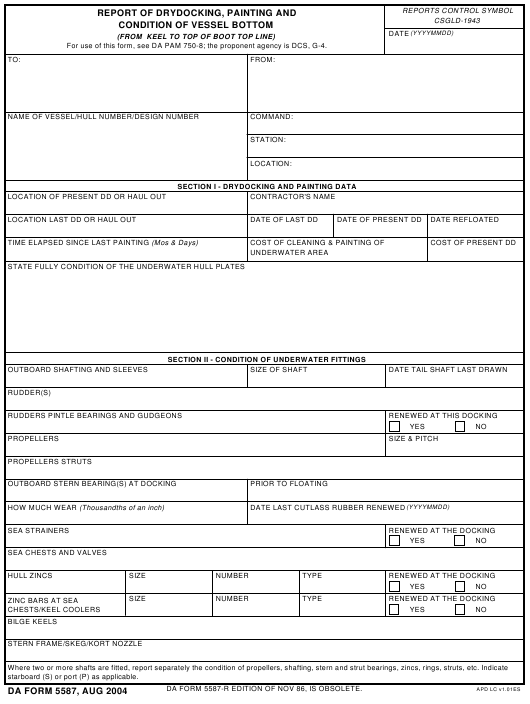 Download an up-to-date fillable DA Form 5587 down below in PDF-format or look it up on the Army Publishing Directorate website. For use of this form, see DA PAM 750-8; the proponent agency is DCS, G-4. starboard (S) or port (P) as applicable. DA FORM 5587-R EDITION OF NOV 86, IS OBSOLETE.